The sky blue State Flag of Oklahoma depicts an image to represent the unity of its Native American and European-American cultures. An Osage buffalo-skin shield is the central image crossed with an olive branch and a peace pipe which are both traditional symbols of peace. The Oklahoma flag serves as a symbol of honor, heritage and regional pride and is displayed at state buildings. There is a strict Order of Precedence for flags. State Flags are displayed in order as they entered the Union. Car Flags are often displayed to represent of an individual's allegiance to their state. Oklahoma State car flags are used by their owners as mobile emblems of their home. Car flags are usually made from strong materials and are attached to a car via a pole and clip window attachment. What is the design of the Oklahoma state flag? The Oklahoma Statutes, Title 25, states "a circular rawhide shield of an American Indian Warrior, decorated with six painted crosses on the face". The type, or symbolism, of the crosses are not specified so we are unable to confirm the meaning of the crosses. Who designed the Oklahoma State Flag? What is the history of the Oklahoma State Flag? 1924: In 1924, a contest sponsored by the Daughters of the American Revolution, was held to design a new flag to represent the unity of its Native American and European-American cultures. The winner of the contest was Mrs. Louise Fluke whose design featured an Osage Nation buffalo-skin shield with seven eagle feathers hanging from it. The idea for her design was based on the Osage Nation seal (see below) but she replaced the arrowhead with a shield to which she added six crosses. The Oklahoma flag is kept and used as required by the code specified in the constitution of the state. 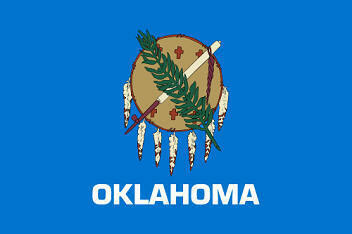 The idea for the design of the Oklahoma Flag by Louise Fluke was based on the Osage Nation seal. The Great Seal of the State of Oklahoma features the seals of the 'Five Civilized Tribes' that consist of the Cherokee, Creek, Choctaw, Seminole and Chickasaw nations. Each of the Five Civilized Tribes had a great seal to represent the people of its nation (refer to the article on the Oklahoma State Seal). These seals was attached to official documents just as the seals that are used by the officials of the various US states and territories. 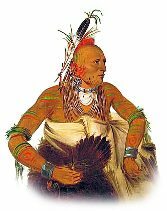 The Osage also wrote a constitution in 1881, basing some parts on the United States Constitution. The Osage Nation Seal has a gold background is a symbol of tribal prosperity. The blue arrowhead represents hunting and war. Peace is represented by a ceremonial smoking pipe, called a Calumet, was often used to seal a peace treaty, hence the term 'Peace Pipe'. The Calumet was also used to offer prayers in religious ceremonies and in war councils. The eagle feather fan stands for the authority of high office in clan or tribal affairs.